A oldie from my collection. - Welcome to The City of Desire. A oldie from my collection. Hiding from a secret crush? There are few Jenny dolls (as in Jenny and not Jenny friends) that I love as much as this doll. I've always had a thing for short dark hair, and even more of a thing for short dark hair and dark eyes. 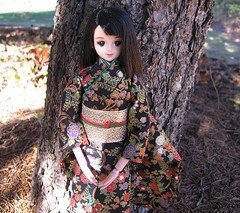 It seems I'm forever trying to recapture this look in the dolls I buy, but this one was the original. She had been hiding in the back of my display case for so long that I had completely forgotten about her.